IF Zodiac did send these tickets, why??? Did he live near the Tagert family and want to see what would happen having tickets sent to someone in the neighborhood? I could see Z getting a good laugh out of something like that. I know the surname Tagert. Maybe I've been told this name and just don't remember. I can say that I've researched that name before. I remember Texas, Presidio Heights and Paul Avery. Oh my. You have given me some work tonight. I think "Taggert" and "Taggart" are the more common spellings, so that might help finding info on Gerald Tagert. I wonder if there is an online directory for 1970 Vallejo to see who lived in that neighborhood. I started looking over this last night and found my own post on the subject from December 2015. I didn't post much, just names. Apparently I was really interested in the Gates family. I don't recall what led me to that but do know that I would be thinking of Darrell Gates. I haven't fully gone back into researching this and so I don't know why Paul Avery comes to mind. As far as Presidio, I remember following Tagerts travels from Texas to New Mexico. I remember looking towards San Francisco and trying to connect his line to the Tagerts I had found in San Francisco. My thoughts were he didn't just show up in Vallejo without a reason. Maybe he had family. That's all I remember for now. Was Darrell Gates a well known person? Or a name we should know? Yes. Darrell Gates was police chief of Los Angeles. He was one of 5 threatened by a possible Zodiac in a may 1978 letter. Who ever wrote that letter, interestingly, knew the correct spelling of Gates name. Darrell Gates was known publicly as "Daryl Gates". Soze wrote: Yes. Darrell Gates was police chief of Los Angeles. He was one of 5 threatened by a possible Zodiac in a may 1978 letter. Who ever wrote that letter, interestingly, knew the correct spelling of Gates name. Darrell Gates was known publicly as "Daryl Gates". Ah, that's right. I thought the name sounded familiar but wasn't sure why. Thanks for clearing that up. Some people don't think at all and can be pretty tasteless when trying to "have a little fun". I don't think it's impossible that someone pretended to be the Zodiac but, this letter, I still think is him. Soze wrote: Some people don't think at all and can be pretty tasteless when trying to "have a little fun". I don't think it's impossible that someone pretended to be the Zodiac but, this letter, I still think is him. Could have definitely been a prank, but I think it was Zodiac as well. Now you tell me if that isn't definite confirmation. Large Target with a letter 'd' leftover. It's not left over. Phonetically it's placed in "Lardge Target" or in "Large Dtarget". It still fits. And I think it is correct. mickeydchicken wrote: It's not left over. Phonetically it's placed in "Lardge Target" or in "Large Dtarget". It still fits. And I think it is correct. I think Zodiac did a lot of little things like that and that most of those fun little things went unnoticed. Eldorado pointed out in another thread that "This is the Zodiac speaking" could be an anagram for "Stephen King is the Zodiac." That one is probably just a coincidence, but it's another one of those fun little things to think about. Was a joke about their Cocaine and Cocaine Smuggling Ring involvement. Remember the Slash and Burn Strategy of the Z taunts....not every letter was about a kill made, or for one that was on the way. These were aimed at Waving the Dirty Laundry, Stealing the Family Jewels, Leaving the Bag in someone's hand through Kindergarten Ciphers used as Nulls....partial, incomplete, extremely far reaching, and overly speculative reactions were their implied intentions in this escape mechanism added. So many people were thinking it was Ed Edwards.....when it was Mr. Ed's Drive In surrounding the first murders in the Lake Berryessa, Vallejo, and other murders. They would stalk them at the "Diner's, Drive-In's, and Dives" and murder them at Lover's Lane areas. This was to scare the children of the "Concerned" Conservatives of "Camelot"
Setting the stage for the good "Mormon's and Evangelists" to take us to Jonestown.......to "Safety"
This "promised land" movement began to develop a following through deceptive religious interests. Selectively segregated, the populations were given different news, points of view, and used to target a "minority" population and feed them different influences through mainstream productions, and manipulate them through these Psych Warfare techniques alternating between repetitive trauma based engineered stories, while the intermission between operations was fueled with "predictive" programming that would interfere with the perception of events and the players who are netting from them. The foundation of this Police State were then stepped up and were set to look "Official", complete with "Nazi-esque" uniforms and gear, as the Policing efforts were then "Justified" to shut down any groups and the opinionated masses through initiating the expansion of Co-Intel Pro, through the removal of Constitutional Law, and the establishment of a "State of War", using the News and expanding the Drug War and the privatized Corrections Corporation of America, throughout the 80's. What transpired there before his election was his way of entering the "Club"
They arranged the killing of ALL the Cult members, of which GEORGE BUSH JR was a known member ! The original Oil Moguls of the Rockefeller and Morgan Cabal of Standard Oil's investments and businesses in the US, and the gold heists that financed the original takeover of the Native American, Spanish, French, and English Territories in a financial coup, plotted 3 world wars, beginning by causing the Great Depression, the sinking of the Titanic (or Olympic) to kill of leaders of the Federal Reserve, and then the financing of the genocide in Russia, with the Bolshevik Revolution, to instill their govt there. We actually go to war because the other nation's leaders see their ponzi schemes coming. It's merely the "Lasting Trust" that the US has instilled in the people's minds that forces the people to refuse to see their own order and elect as being the instigators. 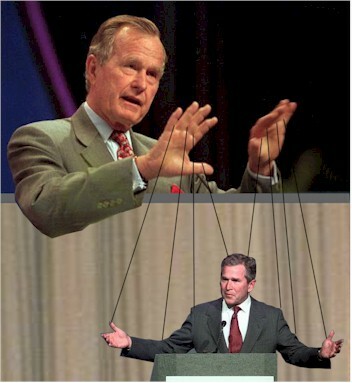 And anywhere you see wrongdoing by George Bush Jr., or as I prefer to call him, "Dubya," you will find his puppet master/father. Sorry, I will stay on topic. Just had to post those.